There are quite a few things in life that are more fun than doing the laundry. Why, then, do makers of laundry care products add some extra complexity to this task by confronting their customers with unnecessarily complicated dosage instructions? 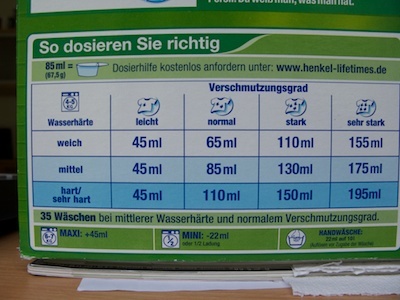 This table on a box of washing powder states how much powder should be used for one full load of laundry, based on water hardness (rows) and on how stained the clothes are (columns). 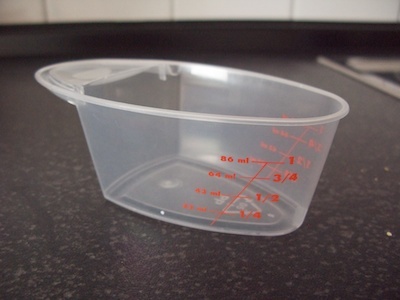 As a convenience to their customers, the manufacturer offers a free measuring cup, which holds about 85 ml of detergent. This cup has a precise scale printed on its side which is labeled with both milliliters and fractions. Determining how many cups of detergent you need is a simple, straight-forward calculation, of course: divide the amount found in the table by the size of the cup. And yet, I would not be surprised if the majority of customers find such math to be inconvenient. To some, it may even be overtaxing. 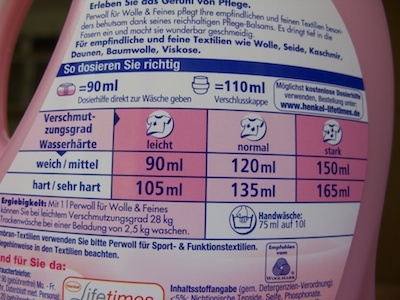 Simply stating the amount of detergent in multiples and/or fractions of the measurement cup would eliminate the conversation calculation, making measuring decidedly simpler and faster. 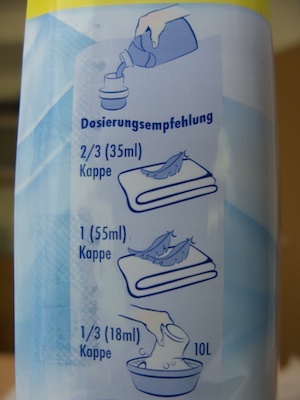 This bottle of liquid detergent features a measuring table similar to the one from the previous example. In this case, it is the bottle’s cap that serves as the measuring device, holding 110 ml. Just like the table on the box of powder, this product also requires the user to convert milliliters into multiples and/or fractions of the measurement cap. Unlike the cup to be used with the powder, however, this cap does not feature a scale, making the measurement even more difficult. Using the cap for measuring 165 ml — 1.5 caps — may still be feasible. But what about 120 ml or 135 ml? Compare the previous two designs to this one, which I found on a bottle of fabric conditioner. 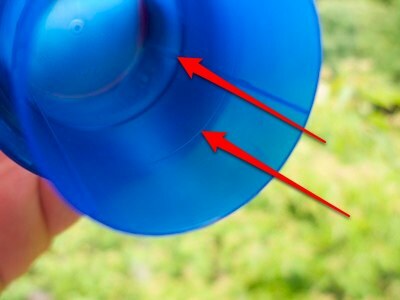 The inside of that cap features fine lines molded into the plastic at 1/3 and 2/3 cap-fulls. Admittedly, these lines are a bit hard to see, but the designers did at least think of this feature to begin with. Using the right amount of this product is as easy as comparing the levels indicated on the cap with what is stated on the bottle, and filling the cap to the required level.